When your meat is finished, remove to rest for 10 minutes and using the roasting pan on the hob, de-glaze the black sticky bits with a splash of boiling water, or better still red wine, sherry or port! Take a couple of tablespoons of the liquid and add to a small bowl of 2-4 tablespoons of gluten free plain flour to make a paste, add the paste to the roasting pan, season generously and keep scraping away at the sides until the roasting pan is clean and the sauce is thickening. Now you can pour on stock (chicken will do if you’ve not got a corresponding stock to your roast meat). Pass liquid bits and all through a sieve into a saucepan and continue to heat and thicken. The meat with have rested by now so carve and retain any juices so you can add these to the gravy in the saucepan. Now! that’s all very well and good when you have the hungry three in the other room waiting for their Sunday Dinner, what about on Christmas Day or any other family holiday when you have a multitude of guests and courses to cater and prepare for, de-glazing a sticky pan for 10 minutes would feel like an eternity! 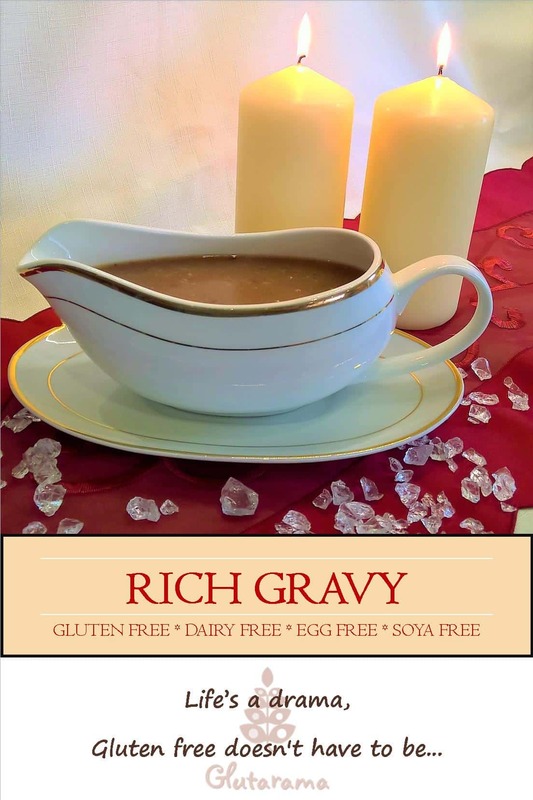 So if you want the kudos of serving up homemade gravy without the effort on the special day, simply make in advance, freeze and reheat when you need it, and even better, use the leftover from a previous roast dinner and pat yourself on the back for your excellent money management skills too! Take your roast chicken carcass and break it up into smaller pieces, add to a roasting pan along with onion, carrots, celery, spice and herbs coat in oil. Pop in the oven Gas 5 for 1 hour to brown the bones, meat and soften the vegetables. Using a wooden spoon set to work on getting all the dried and sticky bits off the side of the roasting tin, add the alcohol to help with this process. Try to mush up the vegetables as much as possible and continue to gently fry, the longer you do this, the richer and darker the gravy will be so have patience. Now add the flour one table spoon at a time, this will prevent lumps forming, mix thoroughly after each addition. Now add 2 litres of boiling water, this is your last chance to de-glaze and scrap of all the stubborn bits on the sides of the roasting tin. Set hob to boil gently for 30 minutes, stir occasionally to make sure nothings sticking to the bottom of the tin. Pass gravy through a sieve into the large pan making sure to squash all the goodness out of the leftovers. Contine to heat until the jelly has melted, check seasoning and add if necessary. This makes 1 litre of gravy which can now be stored in the fridge or frozen until you need it again. On your special day, remember to thaw, add to saucepan, reheat AND add those all important meat juices from the roast meat once it's rested the required amount of time. NextGluten Free Mince Pies – with an orange twist!